Is your refrigerator getting too crowded to keep your wine along with your food? It might be time to upgrade and invest in a wine cooler to better store and chill your wine bottles. Do I need one in my home? Are they different from wine cabinets? What kind of wine cooler should I get? What benefits do coolers with multiple temperature zones have? Can I control the temperature of my wine cooler? Do wine coolers use the same amount of power as regular refrigerators? Wine coolers are a particular kitchen appliance dedicated to, as the name implies, keeping bottles of wine at a certain ideal temperature. Although also called as wine refrigerators, these storage spaces offer a better environment to keep your wine in for long periods of time. The modern wine enthusiast prefers them over traditional wine cellars as they offer more room for customizing temperature and humidity. If you drink wine regularly and like having multiple bottles of expensive wine in storage, you would benefit from investing in a wine cooler. For one, they are more affordable than most refrigerators and more convenient than renovating your basement into a wine cellar. Wine coolers are also pretty low maintenance and can offer other uses than just storing wine. Yes, but they function almost the same. It’s just that wine cabinets tend to be much larger than wine coolers and are meant to store bottles of wine for longer periods of time. The main advantage of wine coolers over wine cabinets is their multiple temperature zone feature which can accommodate various kinds of wine. This depends on your needs, preference and current wine consumption. Freestanding wine coolers are the most common type and usually look like standard refrigerators. You can also opt for a built-in wine cooler if you need to keep a few bottles at hand. Countertop wine coolers are also great for keeping up to 12 bottles of wine. What more, they take up less space than other types. Wine coolers may come with single, dual or triple temperature zones. Single temperature wine coolers are good for keeping bottles of similar wine at room or serving temperature. But if you plan on keeping bottles of both red and white wine while also having the convenience of keeping some bottles at room temperature and others in serving temperature, you should opt for a dual or triple temperature wine cooler. Yes. Since different kinds of wine are meant to kept and served at certain temperatures, wine coolers can be adjusted depending on the kind of wine you have. Some can be controlled directly through a control pad on the cooler itself while newer models can be controlled from the user’s phone using an app. Another great thing about wine coolers is that they’re one of the most energy efficient kitchen appliances. They also consume less energy than regular refrigerators. But keep in mind that your wine cooler’s energy consumption may cost more depending on its size and the temperature of the area where you put it. 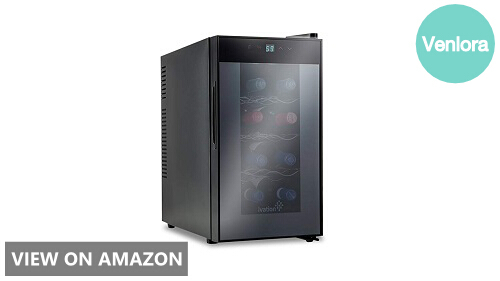 Here are five of the best 8-bottle wine cooler refrigerators we can recommend to you. Read more about what they have to offer below. Equipped with a thermoelectric cooling system, the Nutrichef 8-Bottle wine cooler is an energy-efficient appliance that uses less power than other models. It can be adjusted from 53 to 63 degrees Fahrenheit making it suitable for red wines and good enough for most white wines. 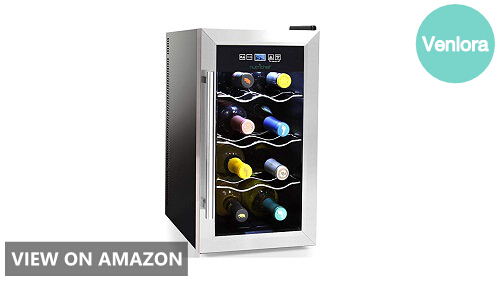 It’s a pretty compact (around the same size as a mini fridge) wine cooler and can keep up to eight bottles of wine. Its racks are also removable so you can keep opened bottles of wine without the possibility of its content spilling out. What more, its design allows it to become either a freestanding or built-in wine cooler depending on the space you have available. This Nutrichef wine cooler looks modern with its black and chrome color scheme and LCD for temperature and touch-controls. 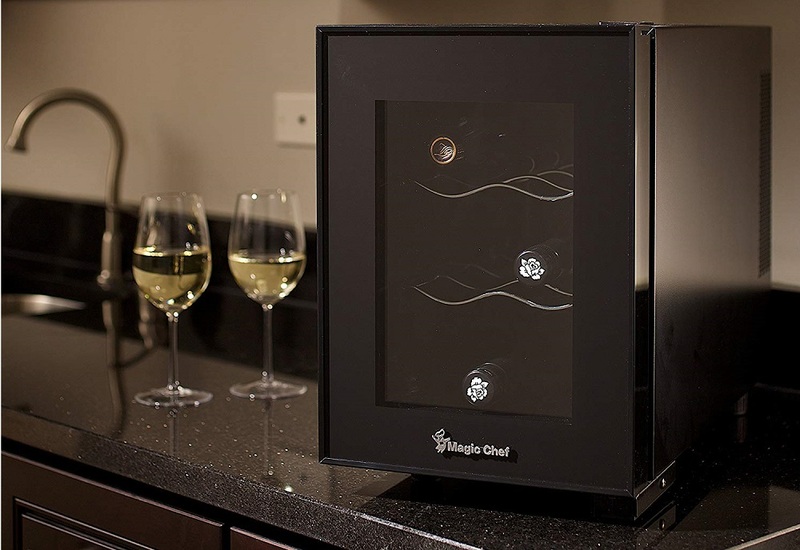 It also comes with a digital lock system to keep your wine safe from your kids’ curious hands. If you prefer a wine cooler you can place on your countertop; the Igloo 8-Bottle Wine Cooler is a great choice for you. Unlike our first recommendation, this Igloo wine cooler is designed to be wider and look more like a microwave than a mini fridge. 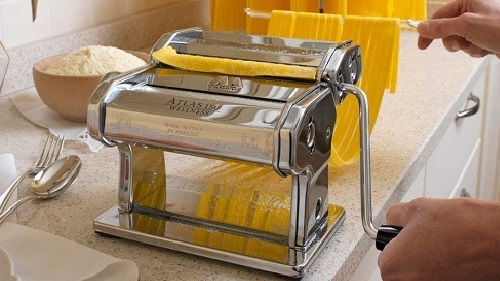 Still, it can offer your kitchen a modern and sleek look. It’s also pretty unobtrusive and would put your available counter space to good use. 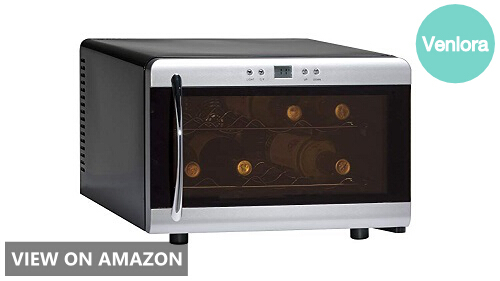 Because of its compact size, you can also keep this wine cooler in your bedroom or take it with you to picnics or beach trips. It’s also equipped with removable wine bottle racks so you can have more control over how you want to position your bottles in case you want them upright. The Emerson 8-Bottle Wine Cooler has a similar design to the Igloo wine cooler above. They share the same microwave-like look and glass door opening. 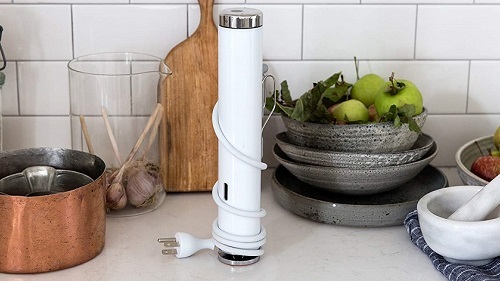 It also comes with an energy-efficient thermodynamic cooling system that eliminates vibrations to keep your wine bottles safe and stable on your kitchen countertop. And because it doesn’t have a compressor, it operates quietly enough to be placed in your bedroom without interrupting your sleep. You can easily control and adjust the temperature depending on the wine you have through its simple controls and LCD screen. If you’re finding the features available in the wine coolers above a bit lacking, maybe the Ivation 8-Bottle Wine Cooler is more your speed. Aside from the usual features, it also offers stable humidity and blocking UV rays with its tempered doors. This freestanding wine cooler also looks pretty modern with its chrome and black colors and its subtle interior lighting. 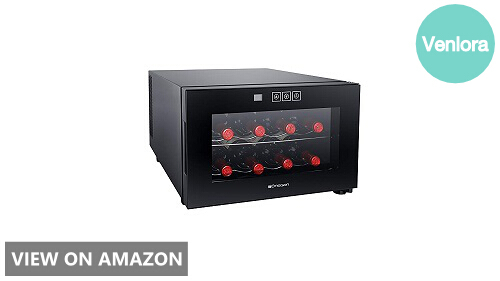 It has a temperature range of 46 to 64 degrees Fahrenheit which is suitable enough to store both red and white wines without compromising their quality and taste as time passes. 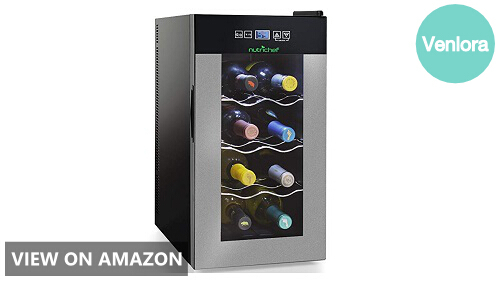 Keep almost all kinds of wine in top shape and ready for consumption with this 8-bottle wine cooler from Nutrichef. This sleek and unobtrusive wine cooler may be the perfect addition to your kitchen cabinets or living room making entertaining guests easier yet classier as well. Impress your dinner guests with this efficient and quiet cooler that can keep wine at just the perfect temperature for drinking whether they be white or red. What more, it can be used for more storage purposes as this Nutrichef appliance can also function as a cheese cellar or a beer cooler performing extremely in all functions according to actual user reviews. Still undecided on which wine cooler refrigerator to get? Here are some guidelines you might find useful in your decision. Take them into consideration and give our recommendations above a second look. Freestanding vs. built-in: As the name implies, freestanding wine coolers are, well, freestanding. Meaning you can keep them wherever part of the house you want. On the other hand, built-in wine coolers are fitted into pre-existing space, say a cabinet space in your kitchen. The advantage of built-in wine coolers is that they offer your kitchen a neater look. Bottle capacity: Wine coolers can keep as few as just four bottles to as many as over a hundred bottles of wine. Before choosing one, you should think about the current size of your collection and if you’re planning to grow it in the future. You should also keep your current wine consumption in mind. Temperature zones: As mentioned above, wine coolers can be equipped with single, dual or multiple temperature features. If you’re planning to keep a couple of bottles of just one kind of wine, a single temperature wine cooler may be enough for you. But you’ll benefit from the other two types more if you have both red and white wine. UV-resistant glass door: Aside from being aesthetically pleasing, having this feature would help prevent UV rays from damaging your wine. Safety lock: Got curious kids and rebellious teenagers in the house? This feature would prevent them from getting into your stock of wine. LED lighting: LED lighting will make your wine display look better without inadvertently heating your wine bottles. Carbon filter: This filter would clean the air the gets into your wine cooler to prevent odors from affecting the taste and quality of your wine. It could also prevent dust from building up on your bottles over time. Touch controls and smart functions: Aside from making your kitchen sleek and modern, these functions make operating your wine cooler easier especially if it comes with an app from which you can adjust the temperature in. 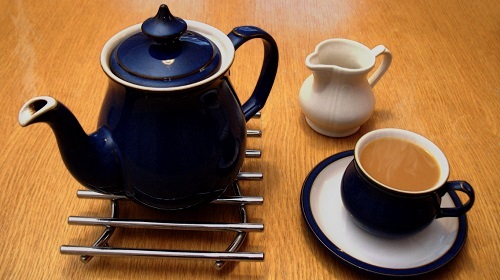 🥇 How Many Tea Bags for 2 Quarts of Water?